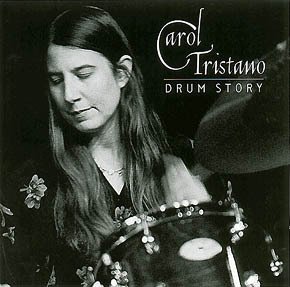 Carol Tristano is a drummer who knows how to set a precise, assured tempo. The concentrated, energetic way that she plays, swinging and fluid, shows that she knows how to get everything possible out of her drums, concisely and serenely bringing out their individual characteristics. As its title seems to indicate, this album is a sort of history of drums, a progression that is also the history of jazz. An air of charm and mystery surrounds this series of rather short (around 3 minutes)almost didactic pieces designated by descriptive titles (“Sticks Storm”, “Brushes Heaven”, “Brushes & Mallets”…) which you listen to in the same way you would listen to a story. 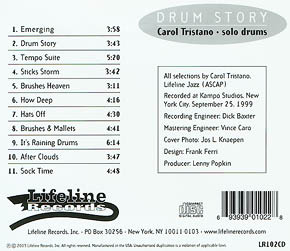 Most often built around an impeccable tempo, Carol Tristano's improvisations are followed by luminous direct constructions, always right on tempo, and with the individual elements of the drum set perfectly balanced spatially for stereo listening.